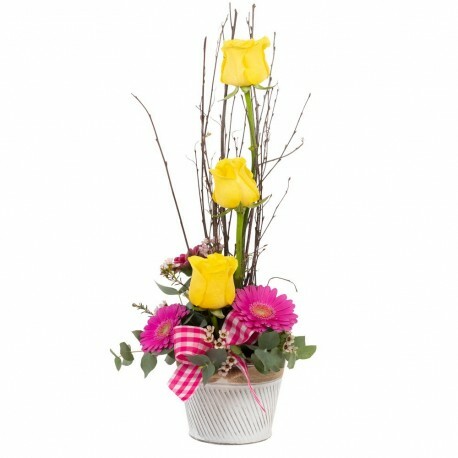 This simple modern style arrangement is arranged into an enamelled tinware container and features yellow Roses in a staggered style, backed by twigs that accentuate the vertical accent. Set into a base of eucalyptus foliage, waxflower and mini Gerberas this is an ideal gift for Mothering Sunday. In the yellow version we use yellow Roses, Mini Gerberas, Solidago, Waxflower, Santini and co-ordinating ribbon and wrapping. Larger versions may be arranged into a ceramic container for stability and incorporate more flowers and a wider range of varieties. If you have any particular requirements then please do let us know, maybe your Mum loves Freesias or scented stocks, just tell us and we can incorporate them into the arrangement. This is an Eco-friendly arrangement as the container can be used again, either to hold a potted plant or maybe returned to us for refilling.